Emerging markets are approaching testing times as the Fed comes closer to normalising monetary policy since conventional and unconventional monetary easing in major economies, in the wake of the 2008 global credit crisis, has fuelled large capital inflows to EM over the past 6 years. How vulnerable are EM to a reversal of capital inflows? 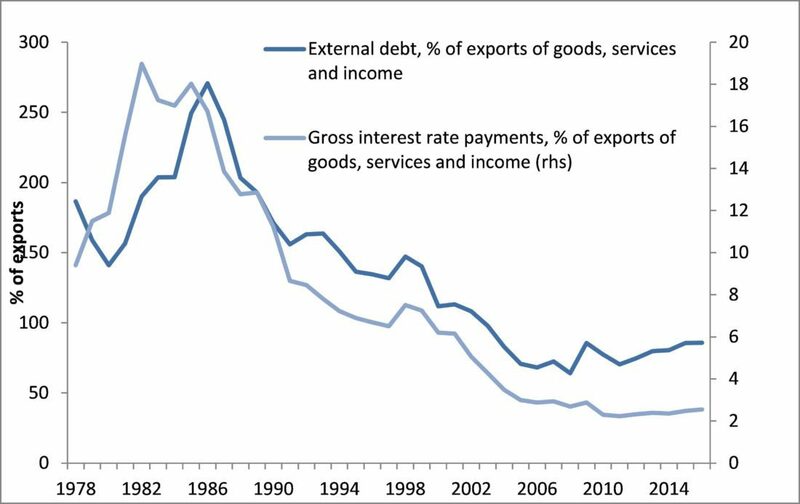 On the surface, indicators of external financing for EM are benign as shown by the low external debt ratio as a share % of exports (below 100%, see chart 1 below). Debt service costs are extremely low too. To the extent that new borrowing has gone alongside an increase in production and export capacity, EM’s external solvency can be preserved even in an environment of higher US yields. Out of external debt, bond debt has gained importance at the expense of bank debt over the past few years. 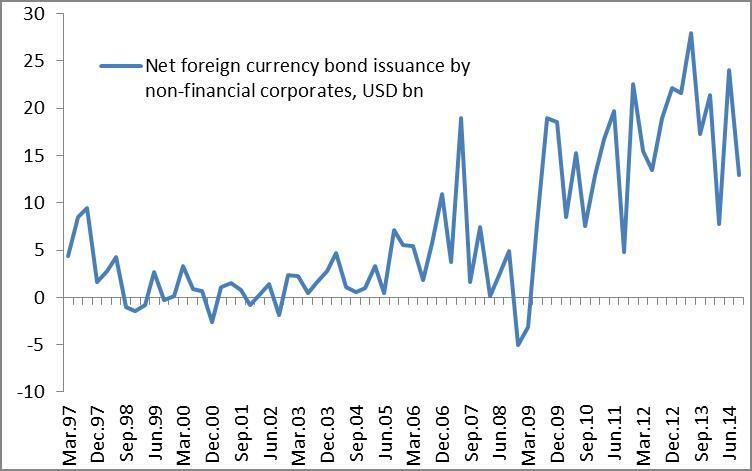 Net corporate bond issuance reached an average of USD 62bn per year over 2009-13, according to BIS data (see chart 2 below). Offshore bond issuance by corporates in China and Brazil in particular stands out over the past 6 years. Specifically, we take a look at BIS data for the external debt in the non-financial corporate sector -which includes bank debt, bond debt and intercompany loans (see chart 3). Brazil stands out as the corporate sector has most increased its external debt over the past 6 years as a share of GDP. Russia, Indonesia and South Africa also participated in this trend of increased external borrowing by the corporate sector. External borrowing by the corporate sector has been much more stable in Mexico and India but the stock is also significant as a share of GDP. 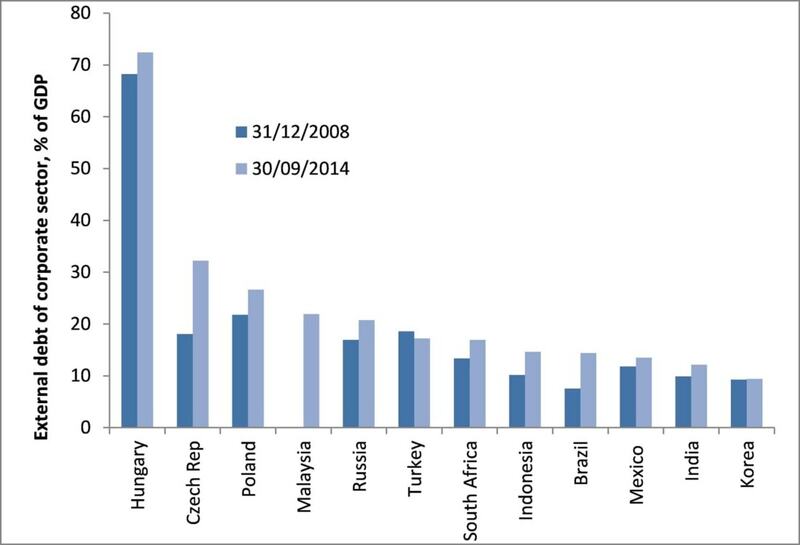 The large debt overhang of Hungary can also be seen in the corporate leverage abroad. Not all funds raised through offshore issuance have been put at work in the real economy and hence may constitute a risk to financial stability, in contrast to greenfield FDI or equity FDI. In particular, EM corporates have used overseas affiliates to borrow abroad and the funds thereby raised may be repatriated to extend loans to their mother company, to other companies, or to make a deposit in a bank. As analysed by BIS September and December 2014 reviews1, how big those “hot money” flows are will be key to EM currencies’ fortunes as US yields rise. For instance, the fact that intercompany loans as recorded in FDI to Brazil have grown to USD 15bn in the year to Jan 15 (from just USD 3bn beginning of 2007) may be anecdotal evidence of a less stable pattern of capital inflows. In addition to grasping how volatile foreign capital inflows could prove fundamental analysis of emerging markets is required in order to measure currency risk. It is important to assess how much of a buffer the economy has in case rollover and funding risks materialise for the corporate sector, as the Fed starts to normalise policy. We monitor currency risk in 16 emerging markets2 on a monthly basis through a risk score system based on warning signals sent by macroeconomic indicators. The methodology for our risk score system is adapted from the approach developed by Kaminsky and Reinhart (2000)3 on early warning signal systems. We monitor the following categories of macroeconomic risks, which usually show a significant deterioration ahead of a currency crisis: economic growth, inflationary pressures and external financing. 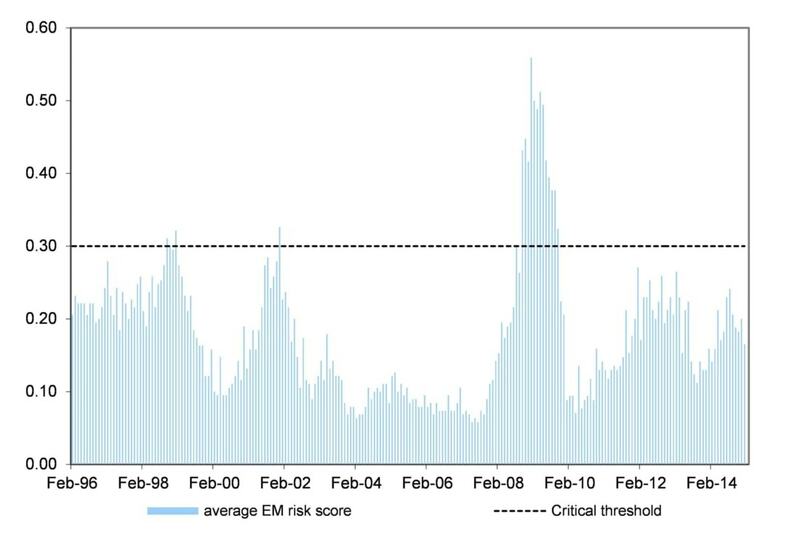 On aggregate, our EM risk score currently stands at safe levels, e.g. below the 0.30 level which indicates high chances of a sharp trade-weighted currency depreciation over the coming months. But two points reveal a less benign outlook. First, the low average macro risk as measured by our EM risk score (see chart 4) mask high differentiation between Turkey, Brazil, South Africa, China, India and Russia that all exhibit high currency risks (e.g. risk score at or above 0.30) as shown in chart 6. In contrast, the risk score of Central European currencies is deemed to be low. 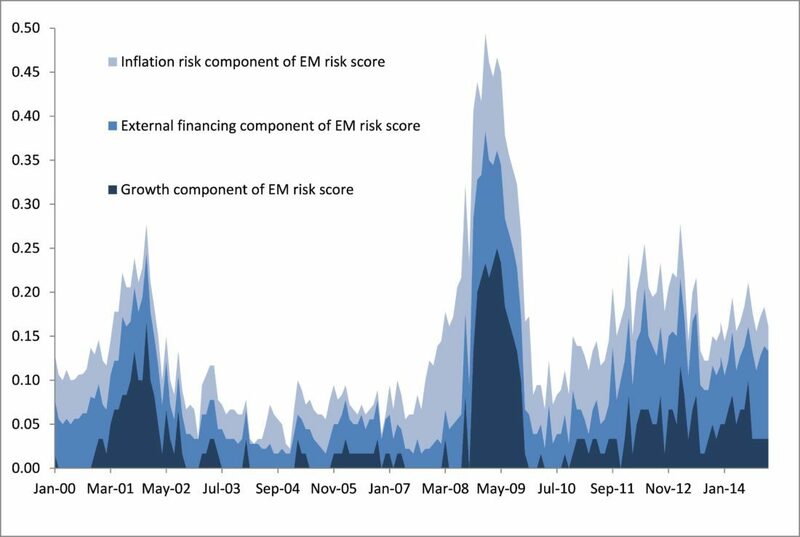 Second, the external financing risk component of our EM risk score has increased (see chart 5) and is as high as just before the Fed’s taper tantrum. This highlights the vulnerability of EM to a shift in capital flows as the Fed paves the way for interest rate lift-off. China’s rising currency risk in our measure reflects the slowdown in the economy, while external financing remains robust enough for CNY to be policy-determined. In our view, increased CNY regime flexibility rather than a significant CNY devaluation is likely to unfold in 2015. But our risk score points to the unusual weakness in the real economy. In case of rising unemployment and risks of social instability – for which there is no evidence at this stage – CNY devaluation would be considered in our view. For now we expect policy response by the Chinese authorities to concentrate on fiscal and monetary stimulus. 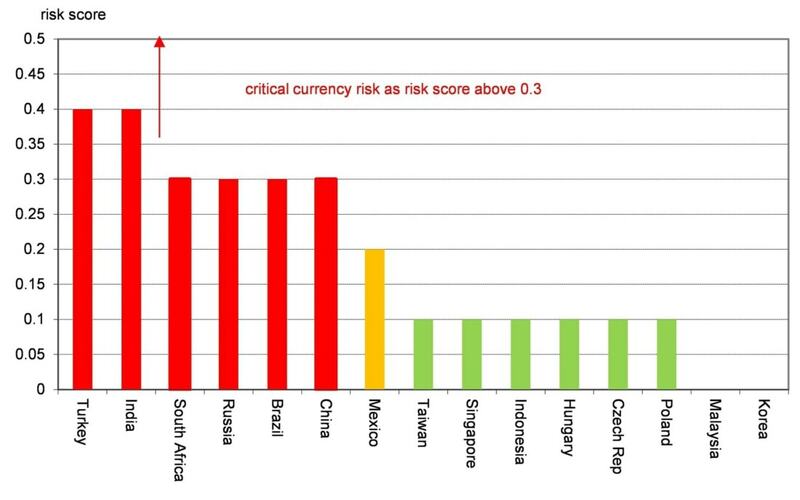 Among the “vulnerable 5” (Brazil, India, Indonesia, Turkey, South Africa) which ranked as high currency risks just before the Fed’s taper tantrum in May 2013, only Indonesia has achieved low currency risk according to our risk score. While warning signals are still issued for Indonesia’s external financing, inflation and growth indicators are back to safe levels. After being in safe territory for most of 2014 amid a fall in inflation and reduction in external deficits, India’s risk score has recently moved back again to 0.30. This reflects disappointing recovery in the manufacturing sector and mediocre export performance highlighting that even a moderate current account deficit may not be sustainable if the global environment deteriorates. As external trade recovery has remained muted in the current global growth recovery, EM currencies may not benefit from the usual protection to a Fed tightening, e.g. higher exports and faster growth, at a time when heavy external borrowing has been built up by the corporate sector in a number of EM. This is the message from our EM risk score indicator, suggesting high yielding currencies are at risk while Central European currencies should be supported, all the more so as the ECB QE is implemented and the Eurozone business cycle turns around. Source: IIF. Data as of 3 Mar 2015. Source: BIS, table 12D international securities. Data as of 3rd March 2015. Note: data by nationality of issuer. Source: BIS, table 12D international securities. Data as of 3rd March 2015. Note: Data not available for Malaysia. Sources: Haver, Bloomberg, Millennium Global. Data as of 6 Mar 2015. The information in this document is provided for illustrative, information and educational purposes only. The information provided herein does not constitute an offer to buy or a solicitation of an offer to sell and does not constitute an offer or solicitation in any jurisdiction in which such an offer or a solicitation is unlawful or to any person to whom it is unlawful. This document contains the views and opinions of Claire Dissaux and does not necessarily represent the opinions of Millennium Global Investments Limited or the funds/accounts it manages or of any Portfolio Managers. The information in this document is not guaranteed nor intended to be complete and material aspects of the descriptions contained herein may change at any time. Millennium is not responsible for any error or omission in this document nor do we accept liability for any losses arising from the use of this material. This document does not constitute a personal recommendation or take into account the particular investment objectives, financial situations, or needs of individual funds or accounts, managers, principals or employees, and we make no representation as to their accuracy or completeness. Certain portions of this document may constitute forward-looking statements. Due to various uncertainties and events, the actual performance of the economy may differ materially from those reflected or contemplated in such forward-looking statements. As a result, investors should not rely on forward looking statements in making any investment decisions. The information and opinions presented in this document have been obtained/derived from sources which we believe to be reliable, and are provided in good faith, for illustrative, information and educational purposes only; it is not intended as investment (or other) advice nor is it intended as a basis on which to make any investment decision(s). While every care has been taken in the compilation of this research document and every attempt has been made to present up-to-date and accurate information, we cannot guarantee that inaccuracies will not occur, and we accept no liability for any losses arising from any reliance placed on the information, views and opinions contained in this article. Millennium accepts no responsibility for any errors and omissions in this document. Neither Millennium, its portfolio managers nor any of its employees will be held responsible for any claim, loss, damage or inconvenience caused as a result of reliance on information contained in this document. This document is for investment professional use only and not intended for public distribution. It is strictly confidential and is intended for your private information only. It is not intended to provide a basis on which to make an investment decision. It is the responsibility of persons to whom this document is provided to inform themselves of and observe all applicable laws and regulations of any relevant jurisdiction. No information contained in this document is to be regarded as legal, tax or investment advice. You should consult your tax, legal, accounting or other advisors about the matters discussed herein. This document does not constitute a personal recommendation or take into account the particular investment objectives, financial situations, or needs of individual funds or accounts, managers, principals or employees. Millennium Global Investments Limited, an English company, is authorized and regulated by the Financial Conduct Authority (“FCA”) and is also registered as an investment adviser with the Securities and Exchange Commission, and is defined as “Millennium” for purposes of these disclosures. Registration with the SEC does not imply a certain level of skill or training.